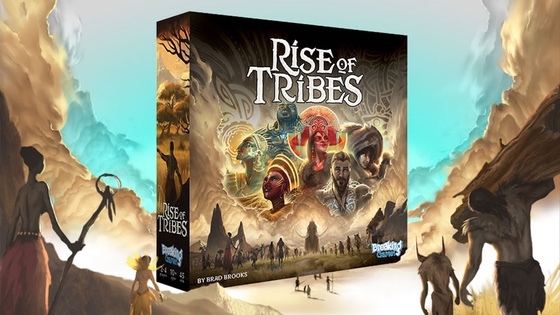 Rise of Tribes is a 2-4 player board game. You are a prehistoric people, looking to grow in number, gather resources and lead your people to victory. Build villages, discover advancements and control territories to win! Design by Brad Brooks (Letter Tycoon), published by Breaking Games. Thanks to Kickstarter, this game is full of upgraded components, more art and epic bonus content. For a limited time, we're offering a reduced price on both standard and deluxe editions. We hope you enjoy Rise of Tribes! Cheers from our family to yours! Happy 2019! As we wrap up 2018, we just wanted to share a couple gifts with you, shared with us. I meant to post this first one with you when we first launched Rise of Tribes - Sergio Chaves illustrated so beautifully these 8 tribes, and I asked him to capture his process for one of them. He did so, shrinking weeks of work for the Tunga tribe into 12 minutes! Then, Rise of Tribes released and went all over the world, and found it's way to the tabletop of composer Veronica Emer in Italy. Veronica has been so inspired by the visuals found in Rise of Tribes that she has composed a beautiful score for each of the tribes. She shared these with me and I set a portion of Sergio's process video - edited to about 4 minutes! to her score for the Tunga. Here's to a new year full of art and inspiration! Speaking of 2019, Rise of Tribes will be back with news of a solo game mode vs the invaders, a promo hex tile for the Mesa, and an expansion, "Beasts and Bronze" - stay tuned for more! Rise of Tribes at International Spieltage 2018! In this update: Essen, Foreign Rulebooks, and teasers for the future of civilization. Breaking Games is going to be at SPIEL ’18 in Essen. (BOOTH 4D102). We're bringing our latest releases - Rise of Tribes, Expancity, Trellis and more! We will have Rise of Tribes Deluxe Upgrades if you missed them. Expancity is selling out at show after show, so if you get excited by building games, tile laying games or 264 plastic pieces in the box!? - come see for yourself! Trellis is a light and beautiful tile game - available at Essen first in limited quantity. German, French and Spanish rulebooks included! You can get these books, printed on the same quality stock as the English rulebook, at our booth (4D102) in the following languages: German, French, Dutch, Italian and Spanish. These match the PDF files that were delivered. Come on by to get one while supplies last! Civilization marches ever forward, and we are so excited to say that we (mostly Brad) are hard at work on a Rise of Tribes expansion, adding in more possible paths to victory! Rumor has it that giant beasts will roam the land while some tribes may seek to enter the Bronze age! It's still in it's prehistoric phase, but we'll keep you updated as it develops! One of our friends, James Rallison, creator of Odd 1s Out on YouTube is on Kickstarter with a brand new card game, Can't Catch Harry! If you like quick party games, and/or cute moths, then go and show him some love. Our friend Brian Henk at Overworld Games is delivering a brand new edition of New Salem: The Constable. New Salem is drafting, set collection, and hidden identity — it’s like 7 Wonders, but with witches! In this update, Rise of Tribes ratings, rules translations, games at shows, stores and more! If you don't yet have your copy of Rise of Tribes, please reach out: hello AT breakinggames DOT com - we're solving any outstanding cases of stone age delivery systems! Rise of Tribes ratings RISING! A quick shout out to those of you who have rated the game on your review site of choice! We're currently sitting at rank #1,515 of all 100,000 games on the board game database to end all databases (Board Game Geek.com or BGG) ! Our goal? Well, besides 15 points, it's to break further and further up this list. If you are enjoying Rise of Tribes (and we hope so), please consider giving it a rating. Here at: BGG (602 reviews!) and/or Amazon too (we have 2 reviews to build on) Retailers use ratings to determine which games to order, and of course user reviews help other consumers decide what to buy. We've been thrilled with the interaction on the BGG site forums from all of you, let alone the fact that the rating has slowly been moving up steadily. One day, Brad announced we had passed Boggle at rank #2002, and I had a laugh. Clearly, our main goal, right? (before we drew a new goal, cycling with our village). Amused, I looked up some other games ranks, for comparison, thought I'd share. Letter Tycoon (#1841) Brad's last published game. He had to top himself. Catan: The Dice Game (#5,492). Just checking. Everdell (#763) Worker placement with a card engine twist, cool bits. Starling Games. Nexus Ops (#347). A cited area control inspiration for the game. Catan (#288). We don't have sheep, but we will trade wood for oxen? Unboxing Contest - Round 2 Winners! First, a picture with our first tray winner, Ryan Kinnaman, who met with us at Gen Con to get his prize and tell us that the game was going over well in his group. So excited to hear! We had no idea that games unboxed themselves in this way. More of our games should do this - looking at you recent batch of Kickstarters received! Maxime found a great way to focus and explore the game components, set to music and fun to watch - clearly a ton of work to make too. Congrats Maxime, you've won a sabertooth dice tray! Runner-Up - Patricio Garcia - "Best Inclusion of a 3 Year Old"
"Want any help?" "Nope!" This 3 Year old is ready to take charge of this game. She's a gamer at heart. She busted the deluxe and found nothing to punch out, but fortunately the main game was able to deliver. Nice video Patricio! And thank you Julie! Congrats, you've won a $10 gift card at the Breaking Games site! Runner-Up - RLL/Report From a Fugitive - "Most Creative"
Brad tweeted out when he saw this, "A Blend of WOW and What did I just watch?" You have to see it to know just what we mean. Truly an inspiring take on an unboxing video! Congrats - you've won a $10 gift card at the Breaking Games site! Rise of Tribes in stores everywhere! Rise of Tribes is hitting stores now. Yes, AND the Deluxe Upgrade - thanks to you all! We have US distribution, and Australia, maybe more (Canada?). If you know someone who missed out, they should be able to find at your friendly local game store - or ask for it if they don't see it. A lot of stores can't stock every game, and waiting to hear what customers ask for. Stores ask distributors, who then listen and order! Demos! If you play games at your local store or cafe and would like to demo and teach it in that store, let me know. We can see about open demo copies, if supplies permit, future promos, etc. I know that this game is on the table, it will get played and enjoyed, so the more tabletops we can get it on, the better. Thank you. Rise of Tribes Debut at Gen Con, PAX/Spiel next! Speaking of games on the table, Rise of Tribes debuted at Gen Con 2018, and was a big hit. All our ticketed events filled up, (hundreds of seats! ), and we had 4 games going in the booth at all times, all 4 days. The Deluxe Upgrade sets sold out, and the standard edition near emptied its stock as well. We are thrilled! Brad was on hand to teach the game, along with some great help from Envoy volunteers, Greg Barry and Mike Walsh. Having fun at Gen Con! Spiel news! Thanks for all who have reached out about joining us at Essen. We are still looking at our staff needs, and will reply to you all, and welcome the help if it works out for both of us. Also at Essen - 2 notes - we will have a small number of Rise of Tribes rulebooks matching our digital PDFs in German, French, Spanish, Dutch and Italian, cost TBD, but we know some may want an official printed copy. Secondly, we are debuting a new tile laying game Trellis, (has some flavor of Tsuro and Carcassone in a light package), one we are excited to debut and which comes with German, French and Spanish in the box! PAX Prime - just days from now! At the top of the Skybridge! Essen Spiel - October - We're excited to meet our International backers! BGG.con - November. We might have a special BGG promo to talk about, stay tuned! PAX Unplugged - December. A great end to the year! Come say hello if you're at these conventions! Foreign Language PDFs - Update! We've finished the rulebook, leader, goal and event card translations for German, French, Spanish, Italian and Dutch! Notice the little numbers in the corners of your cards? Those correspond to the PDF book for easy reference and look up of any card. If you requested one of these PDFs in the pledge manager, links should have been sent out to your email (except Dutch, clarifying one thing first). But feel free to reach out if you miss it. We're close on Hungarian, Mandarin and Brazilian Portuguese. More info to come! A special thanks to not only our translators, but also all of the backers who chimed in with notes to help us refine these documents! You are appreciated, and you've made the game accessible in more households! Now it's time to take a peek at the last leader in our series covering the factions and corresponding leader powers in the game. By now, most of you know all of these, and have no doubt checked out each one. But feel free to shout out your favorite leader power in the comments! AGRICULTURE - If you can get your tribe settled on a remote lake, you might be able to get a few villages before the other tribes worry too much about it. By then, your fish will be plentiful and the 15 points is within easy reach. CUNNING - Opponents will often forget that at any turn, you can make conflict occur when you need it to. This gives the Dananu player an edge for goal cards, a nice contrast to the village building strategy on the flipside. Dananu offers players an interesting contrast in play styles, and you get to choose AFTER the board is setup and in player order, offering you flexibility. Well, I guess our work is mostly done here. I don't want to leave. I love all the interaction here on Kickstarter! Stay in touch, share your experience with the game! For those who haven't joined, we have a Rise of Tribes Facebook Group that is full of chat. Until next time, when I shall reveal some more info on sequels to the game, promos, solo mode?, new games featuring Sergio's art and more! With Canada now receiving copies (huzzah!) and many other deliveries becoming real across the globe, we are now well on our way for phase 1 complete in our master plan to introduce Rise of Tribes to the world! As we head into Gen Con 2018, many reviewers are coming to the booth, every single event we posted in Hall D is sold out, and we're jumping up the charts on BGG. What a thrill, and we thank you all for making this game a reality. We really hope you enjoy this game. Unboxing Contest - Round 1 Winner, and Round 2 Begins! Before i announce the winner of this contest, we want to say how blown away we were by the number of videos and the creativity in all the fun entries. Thank you to all! Some folks were making Rise of Tribes their first unboxing video. One of our entries became the beginning of a youTube review channel! It was a tough choice for Brad, but he has selected a winner, and has two runner up prize winners as a bonus! Great use of story with the tribe meeples doing the discovery, and this video shows off the standard and deluxe components well, plus fun music and opticals. Congrats Ryan, you've won a Rise of Tribes Sabertooth dice tray! Runner-Up - Bob Rice "Best Use of Family"
Bob had his nieces open the game, and this really captures the exploration in an unboxing video, plus a post game summary! Congrats Bob, you've won a $10 gift card at Breaking Games site! Runner-Up - Kyle and Katrina O'Brien "Best Use of Cat"
This unboxing video is delightful. Worth a watch for the interludes alone. Thanks to both of you for making this, and cheers on starting The Rolling Meeple on youTube! Congrats Kyle and Katrina - you've won a $10 gift card at Breaking Games site! But wait, there's more! We know some of you just got or are getting your game, or are still inspired to make a video for a chance to win a Sabertooth dice tray. Here's your chance! Once again we'll consult Brad Brooks on which unboxing video is the most fun. We'll choose just before Gen Con, which begins on August 2, so this is backers only! Thanks again to everyone for participating. Spiel 18 - Next up, we are attending Essen/Spiel in 2018, which is a big trek for us and our team, so we cannot bring much staff. We are always in need of a little help, and as Rise of Tribes will be one of our main focuses - with a lot of International attention - I wanted to ask if anyone bilingual is attending (particularly speaking German, French, Spanish, Dutch, Italian, etc) is up to volunteer with us? We would be happy to talk about a pass to the show, meals and games in return. There is a possibility that we will have a fully printed box in some of the languages mentioned above, and of course we would be happy to give one of those copies, as we seek to share Rise of Tribes produced in another language! Box Contents Video #1 - find all the stuff! Box Contents Video #2 - store all the stuff! Coming up soon - all about events - Brad is creating a doc about event cards, and we'll make videos as well, that go over the event cards in more detail. So far, we've looked closely at the Mu'k'a'an, Daba, Kia-Kia, Tunga, Indartsu and Kaha tribes. Now, let's check out the Kiror faction. Leader powers are easy to mix into gameplay - just choose which side you want to be your power for the game. EVASION - The best offense is a good defense. While this might be a rare power to use (only on defending, only into a controlled hex, only if that doesn't cause conflict), it can be used to great power. We've heard reports of tribes making seemingly great military positions for the stone age, truly using borders and position to advantage. Watch out! PATHFINDER - As you use tribal leader powers, note that you don't choose them until after the map is created, and in turn order. In this way, you can choose pathfinder when the time is just right. Move across the entire map to an opponent, or use this to get goals done quickly. Both Kiror leader powers are great for board position! Cheers to all, thank you and enjoy your games! July is the most amazing month ever. I thought it was last July, when we completed and funded this massive Kickstarter campaign. But no, THIS July - games are arriving, and that's the best! Seeing the pics and praise already from it hitting the tabletops has been so exciting! We are busy shipping, answering questions, resolving issues, posting FAQ, designing scenarios and more! O Canada! Where did the copies go? Well, it took a bit of time to get these from dock to Snakes and Lattes in Toronto. But good news - these are being shipped by early next week at the latest, hopefully with tracking slips generated this week. If you are wondering if your specific country is shipping soon, the answer is YES. Our UK shipment, which covers most of the copies ordered around the world, is shipping starting now, and expects to have all packages in the mail by Thursday. This is early, so we are thrilled! So just to reiterate, you may wonder... I live in _______, is my copy shipping?? All other countries not in the world cup anymore (sorry Belgium)- YES! NOTE: If you think you are missing either dice or an action board, please be sure to double check, as these items are sneaky and sometimes hiding from you. We've posted 2 videos on youtube explaining both what's in the box, and how to put it back! We're around to answer any questions you might have - you can ask on Kickstarter, you can ask in our Facebook group, or you can check out the Official Rise of Tribes FAQ on BGG. Thank you to Brad Brooks for maintaining it with the latest/greatest questions and thanks to all for engaging there. Also a shout out to Mike Vander Veen at Print and Play for jumping in and answering a ton of BGG questions and running our Breaking Games account on BGG! With the imminent delivery of Rise of Tribes worldwide, we are working hard to complete the many digital language PDFs planned. I want to offer my sincerest thanks to those backers who have been working on these and Chris Strain on our team for helping get the finals finished. Here's a brief status of each language, in the order I expect them to complete. Please bear with us if the delivery does not match day and date with receiving your copy. Know that we're going to finish these as planned, even as they take extra time and care. German PDF - translations by Torsten Sammet. Translations complete, layout complete. Torsten to review final layout. French PDF - translations by Julien Gerard. Translations complete, now in layout phase, then final review. Spanish PDF - translations by Roberto Zaragoza Gascón and Astrid Dalmady. Translations complete, pending layout phase, final review. Dutch PDF - translations by Wim Leenaerts - Translations complete, pending layout phase, final review. Italian PDF - translations by Mirko. Translations complete, pending layout phase, final review. Hungarian PDF - translations by Baratosi Botand. Translations complete, main rulebook complete, pending bonus layout, final review. Mandarin PDF - translations by Wei-Chun Yang and Mike. Translations and layout in progress. Brazilian Portuguese PDF - translations by Filipe Raitz. Translations complete, pending layout, final review. Turkish PDF - translations by Cakir Alp. Translations pending completion and layout. So far, we've looked closely at the Daba, Kia-Kia, Tunga, Indartsu and Kaha tribes. Now, let's check out the Mu'k'a'an faction. Leader powers are easy to mix into gameplay - just choose which side you want to be your power for the game. INTIMIDATE - The best offense is a good offense. Get out of my hex! This is a great ability to have flexibility over the achievement cards and also be able to keep up with the rest of the aggressive factions. SHARED BOUNTY - Let me in your hex! This is the fun opposite feeling to many of the isolation strategies. Yes, you'll have to convince the other tribes to leave your scout alone, but this fits with many of the achievement and development cards. Here you want to be with everyone, because every single gather then helps you. Both Mu'k'a'an leader powers feel great for a goal card strategy! Don't forget our unboxing contest part 1, mentioned in the last update. We're still taking unboxing videos through July 15 and picking one lucky backer who shared to win a Sabertooth Dice Tray!